Just back from a 9-10 day break, mostly spent in extraordinary, dazzling, dramatic Languedoc. 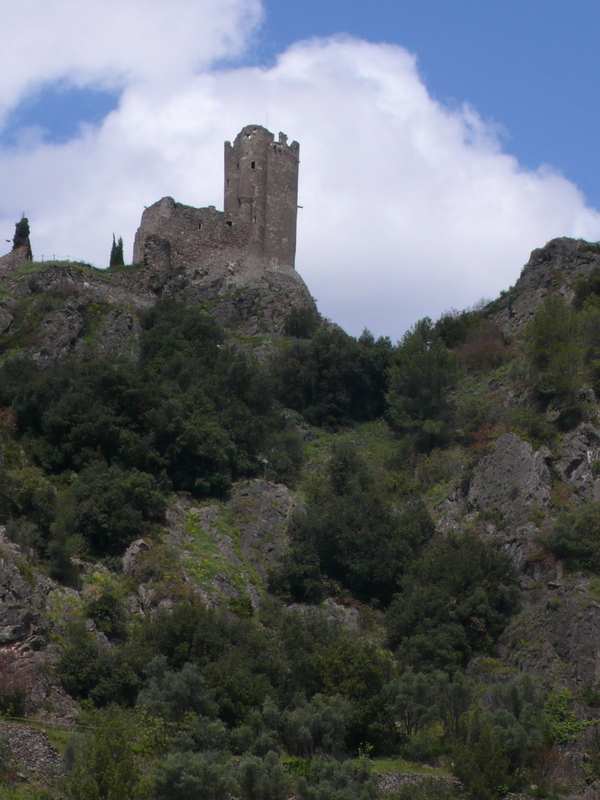 Languedoc, means (Land of) the tongue or Language of Oc -Occitan being the ancient language of the area. It is a region that has long exercised the medieval-obsessive imagination of your correspondent, your writer-blogger-chappie. As a land of huge Cathar castles, at places like Montsegur; Lastours and Saissac, (pictures above) all perched on their craggy, towering cliff top peaks; of mighty monasteries and cathedrals; of battles and crusades, of Eleanor of Aquitaine and her troubadour poets, singing of knights and of courtly love; of stunning tapestries and religious sculptures. Indeed as a crucible for almost everything that fires the mind about our sometimes cruel, yet often vivid and glorious medieval past. Because most of our images and ideas of that time either originate from, or found their highest expression in this region. And it still shows today. 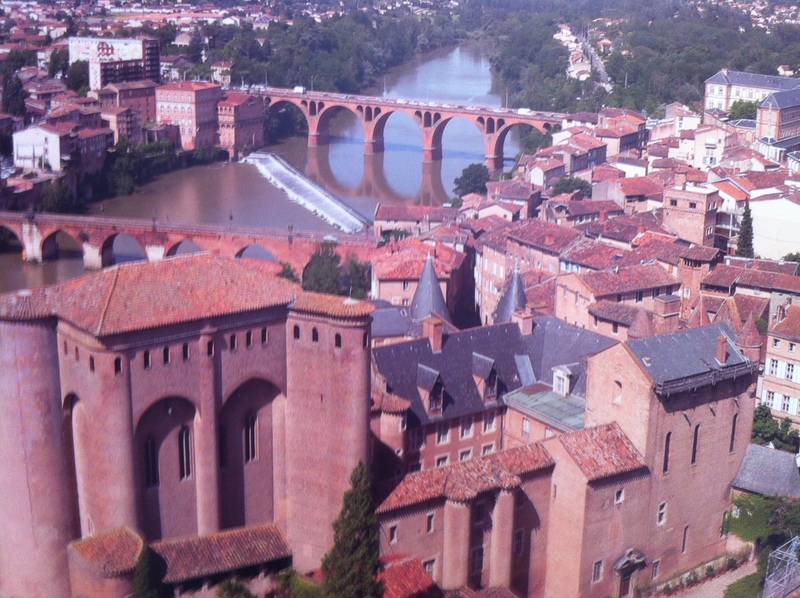 Take, for example, the lovely town of Albi. (Pictured above) Albi was not especially prominent at the Roman Conquest, nor even built up by them in the Pax Romana following the Bello Gallico of Julius Caesar. Yet by the 9th century of the first Christian millennium it was growing rapidly. By 1040 the town was clearly highly prosperous, building new walls to contain and defend its expansion, as well as somehow building the dramatic Pont Vieux (the Old Bridge) miraculously spanning the deep plunging ravine of the River Tarn far below. The prosperity that allowed Albi all this was based on the woad trade, woad (Isitis Tinctoria) of course being both the plant of that name and the fabulous blue dye extracted from it. For centuries this precious substance was one of the 3 staples of the dyers trade, prized for textiles and tapestries; the others being weld (green) and madder (red). Today the deep rich blues from woad have lasted better than the others, as you’ll see, the next time you gaze in stupefied awe at some medieval tapestry in Windsor or the Musée de Cluny or where-have you. There were other centres for Woad across Europe, but the Languedoc triangle, in between the cities of Toulouse, Carcassonne and Albi, was the best, richest and most productive of all. Of course tolls extracted from medieval travellers using the Pont Vieux just made Albi even wealthier. Soon it was the home of a cathedral and the seat of absurdly rich and powerful bishopric. The Albigensian crusade against the Cathars, launched first by the Pope from 1208, and later by the King of France, the battles and sieges that ensued and the brutal Inquisition that followed, when thousands were tortured and hundreds burnt at the stake for their Cathar “heresy” set the whole region badly back. Yet Languedoc was far too rich a region to decline for long and a triumphant and resurgent Catholicism proved determined to make Albi a glorious hub of fabulous riches in architecture and extraordinary religious art, as evidenced by the city’s new cathedral, St Cecilia, rebuilt from 1287 by its new Bishop , the evil Bernard de Castanet. But he did clearly know a thing or two about where evil Bond-like villains and murderous medieval Bishops should live, especially if they already lived perched on towering cliff top redoubts. We must give him that. Just look at the Cathedral he built, for heaven sake. So, aptly enough given the bitter epic war experienced by the region during the Albigensian crusade, his Cathedral looks like some vast towering military castle. Like some vast fortress tower-thing, inhabited by an evil wizard, like something from Lord of the Rings, you might almost think. Well, you might think that initially, before nodding sagely to yourself and noting that well, on reflection, it would be more accurate to say from Tolkien to Mervyn Peake of Gormenghast to the makers of Game of Thrones: every author, filmmaker and video game designer fired by medieval grandeur has been inspired directly or indirectly; by Albi and by the Cathar castles of Languedoc, knowingly or otherwise. 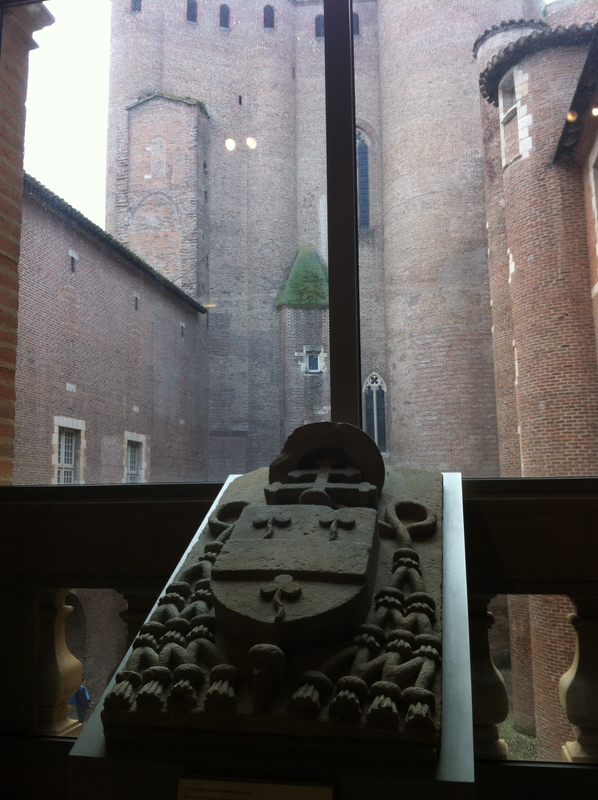 Below, a detail of the arms of Antoine Duprat, from inside the museum, in the background is the looming bulk of just one part of his unfeasibly large palace. 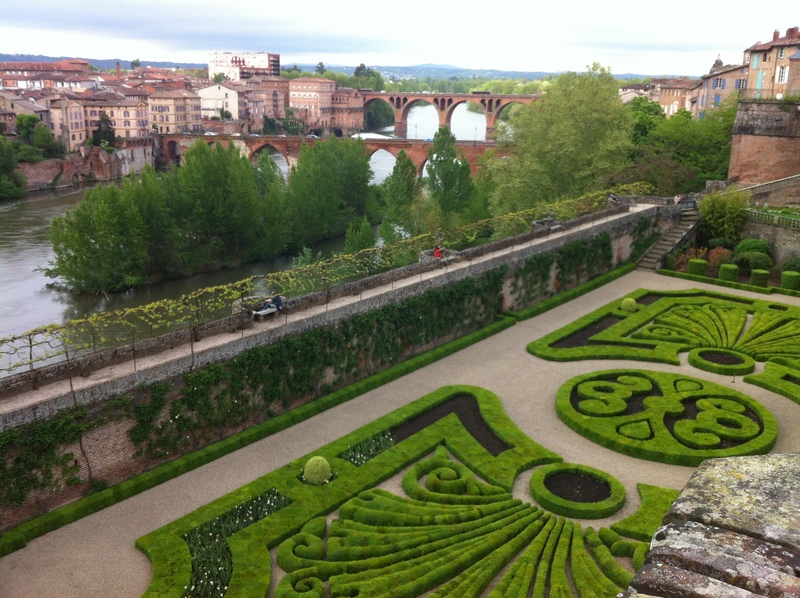 Naturally, on the far, river side of this blockbuster fortress-palace thing, it all comes complete with formal gardens on the far terrace, overlooking the high cliffs that plunge down to the River Tarn. Today his colossal palace is home to a museum and art museum, much of that given over to Albi’s most famous son, Henri de Toulouse-Lautrec. 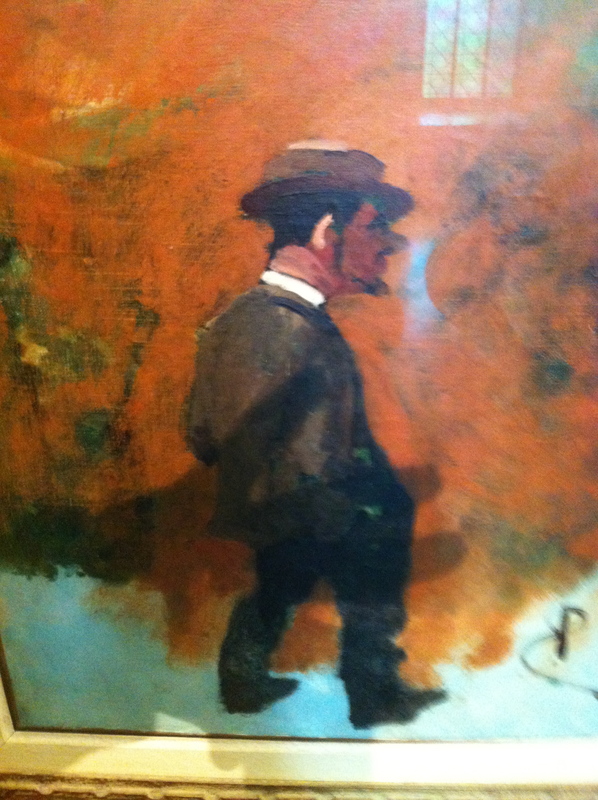 This wonderful artist was vertically challenged, (due to both a congenital condition and to horse accidents) yet intriguingly also the man known to the prostitutes of fin du siècle Paris as “the teapot” – for reasons I shall not dwell on here. 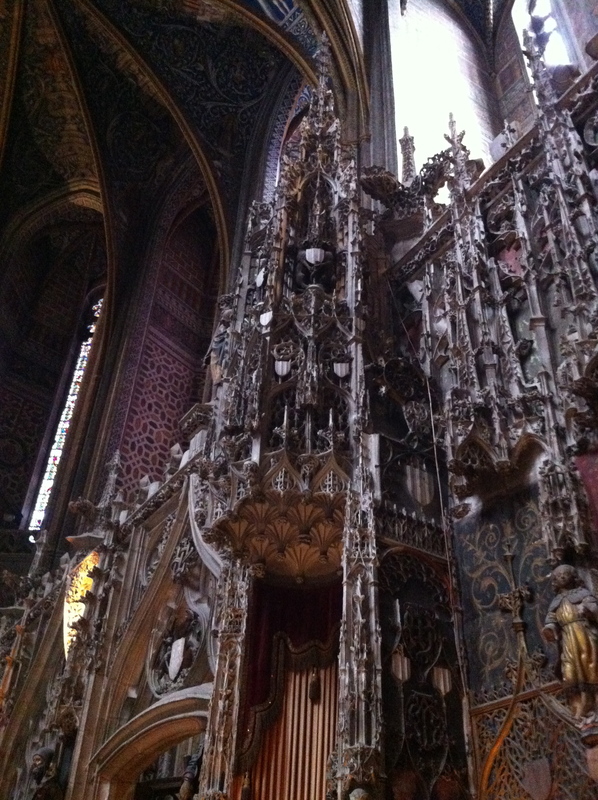 But back to the cathedral which is not only very jolly big but also inside, very lovely inside. But it is extraordinary in another sense too. In much the same way as the earlier Cathar threat, the later Reformation challenge of Luther, Calvin et at first produced from the Catholic Church another, gigantic, hissy fit, another rash of of burnings, torture, Inquisitions, excommunications and so on. But (unlike the Cathar threat) it also forced the Church to take a look at itself. And this, specifically following the Council of Trent, produced a level of church reform over time. For centuries the earlier medieval cathedrals had a sort of inner-sanctum area, where the sacraments were performed and the choir sang, all hidden away from the ordinary faithful outside. The Eastern and Greek Orthodox churches still do much the same today, via a screen usually studded with icons and called an “iconostatis” Anyway, this area is/was protected and hidden by a Rood Screen, forming the inner area. 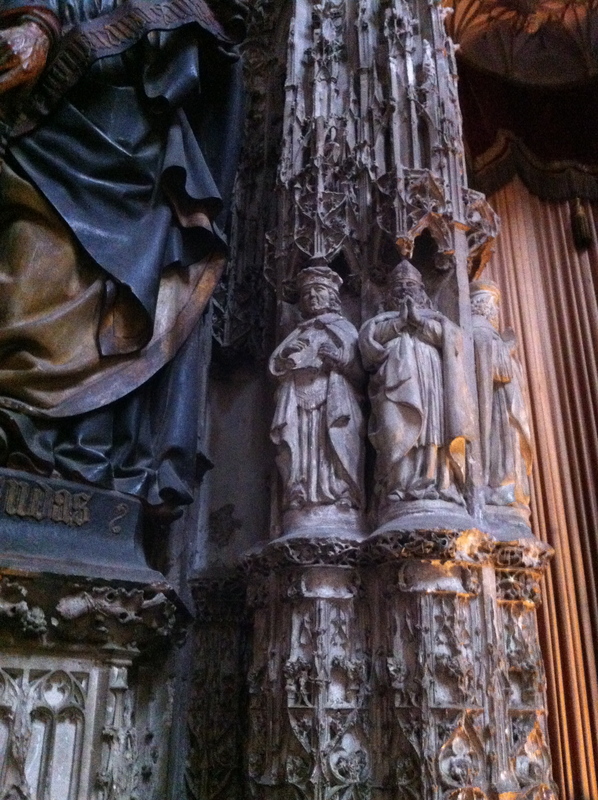 You see one small detail of the “outside” Albi’s Rood here below, just ne detail of millions. 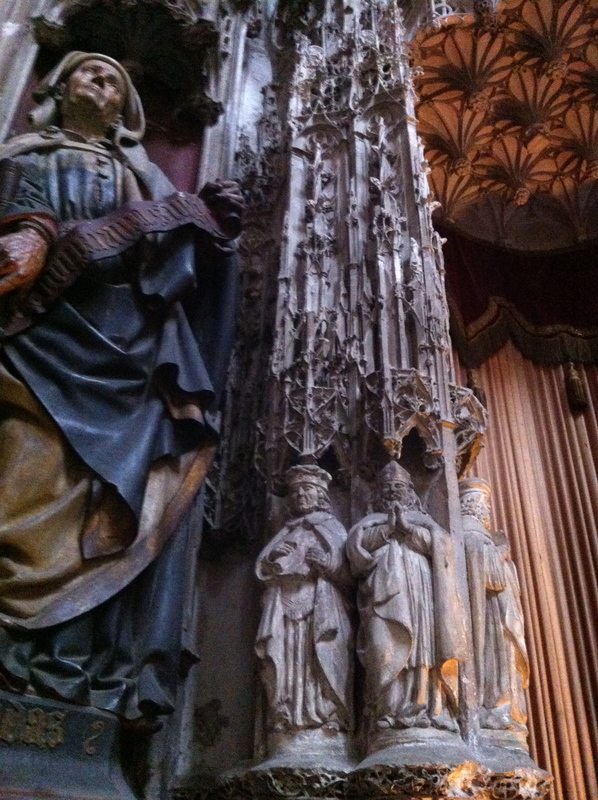 Have a look at and around the corners of this picture, and try to visualise how it fits into the larger cathedral. 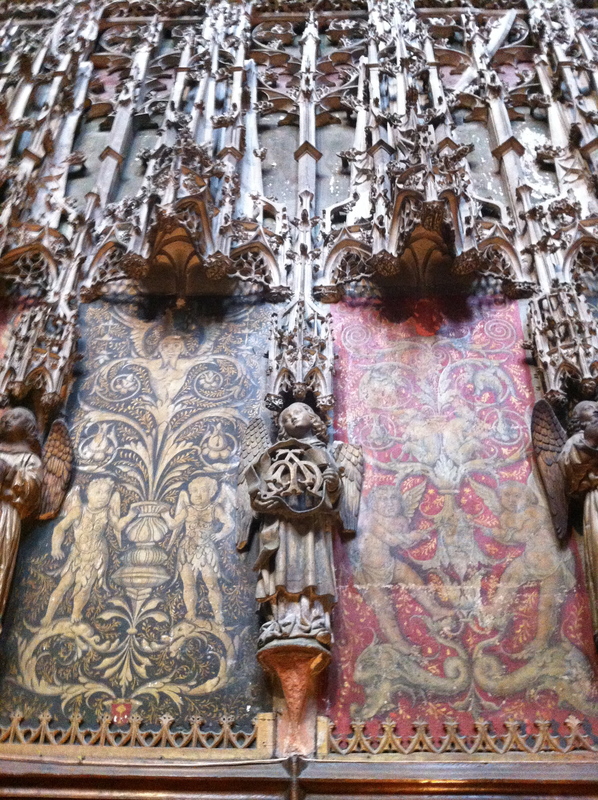 Inside the Screened area, is almost more ornate and splendid, if you can imagine that…. 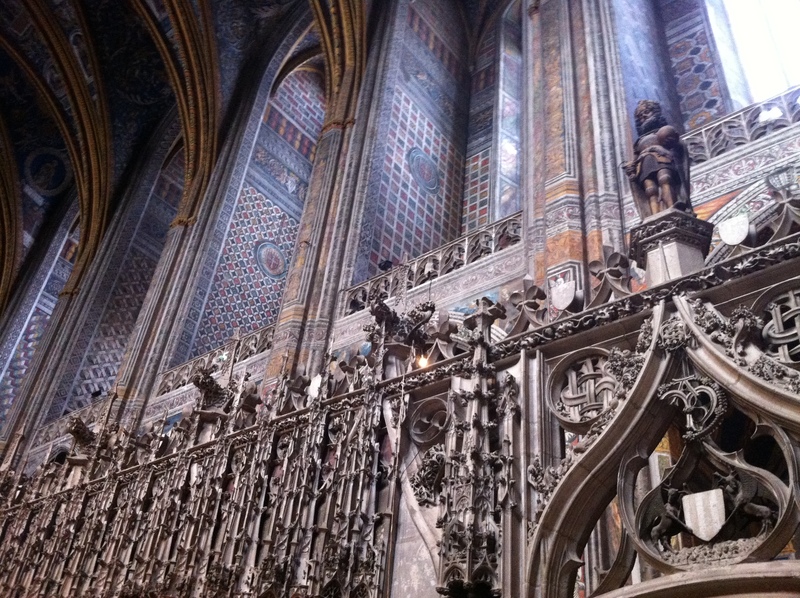 During the Counter Reformation, this sort of “screen” (almost more like a building within a building in fact) was seen as contrary to the edicts of the Council of Trent and so (in the still-Catholic countries) most were removed. 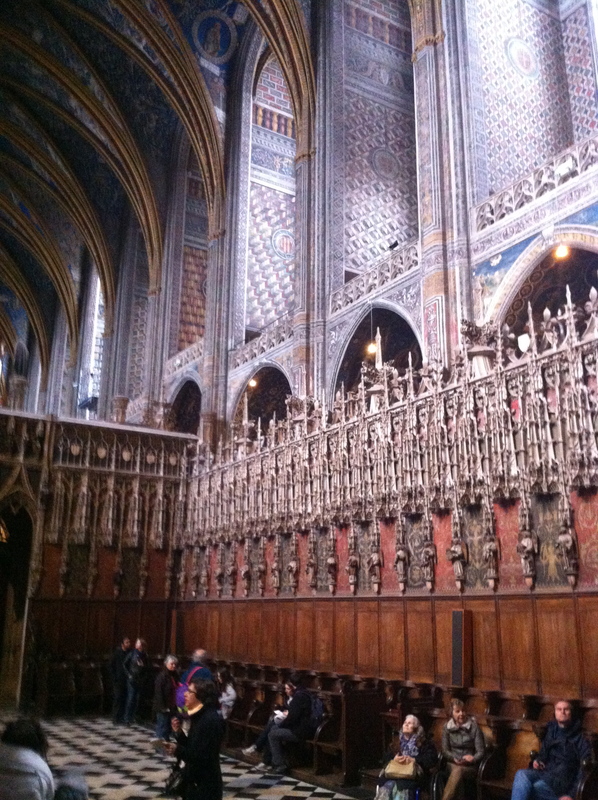 Albi is the only Cathedral in France that still has its Rood Screen, although that term hardly does justice to the architectural & sculptural masterpiece you see here, which, apart from being studded with various saints and prophets, is actually bigger than some churches. Inside the cathedral, but outside the screen, it is not physically possible to get far enough away from the screen to capture the overall size and shape. The two pictures below, from inside the screen might give some idea, although it entirely misses the lavish & stunning decoration. After gawping at it for about 10 minutes, I actually broke my cardinal rule. I usually subscribe and advocate, a policy of pure looking, and thinking) But on this afternoon, I went off and got myself, shudder – an audio guide, just to see if I could find out more about it all. It transpires that the local rock is some type of oolithic limestone. I learnt that is somehow, miraculously, – reasonably soft, pliable and – very important- not brittle when first quarried. So, it can take a lot of close work and stand up to incredible, tiny detail without cracking, shattering or fragmenting. Then, it hardens over time, (which I suspect gives the edges a harder, shaper, cleaner line). A perfect stone really. Of course none of this is of the slightest use or significance without the dazzling, almost surreal skills of experienced, virtuoso master artisans & craftsmen. I mean you could hand me a Stradivarius and ask me to play you a tune. but I don’t think the equipment or raw materials would make a bit of difference. I am in awe of these people, basically. 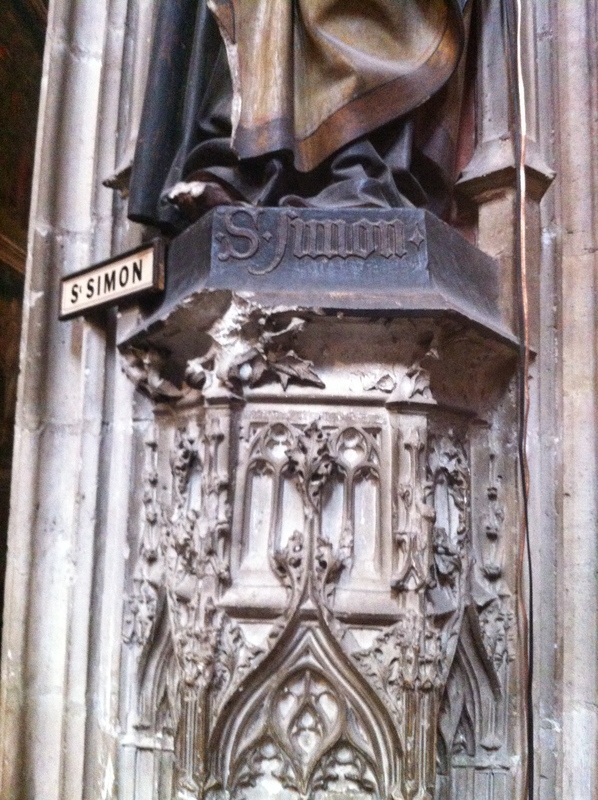 Yes, look below, this is stone, above the angles. This was carved, from stone. Unreal, no? 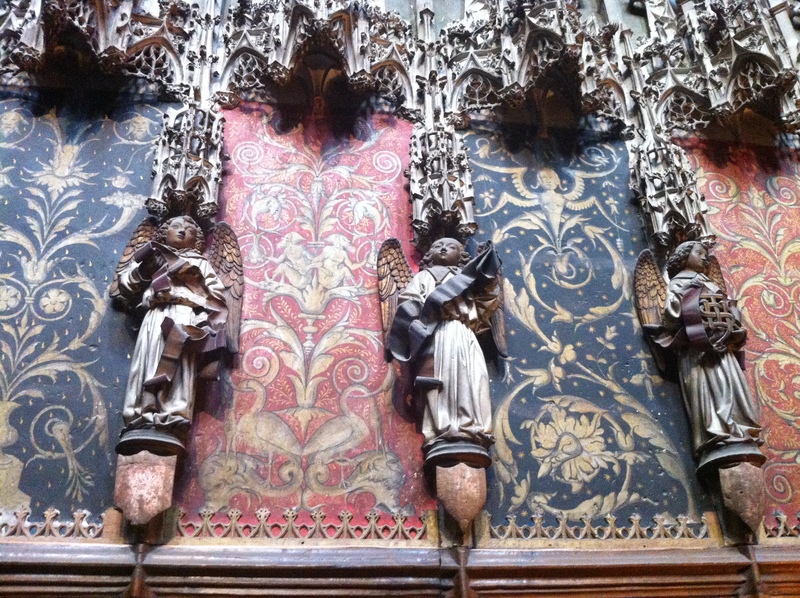 The Albigensians, by the way, preserved their super-duper Rood Screen by the simple and sensible expedient of just leaving it where it was, at the east end of the Cathedral, while moving the altar, choir and sacraments down to the west end of the Cathedral. Quite right too. It’s a shame that more didn’t do the same. If this masterpiece is anything to go by then you have to shudder when you think what other treasures have been lost. One wonders why other centres did not do the same. 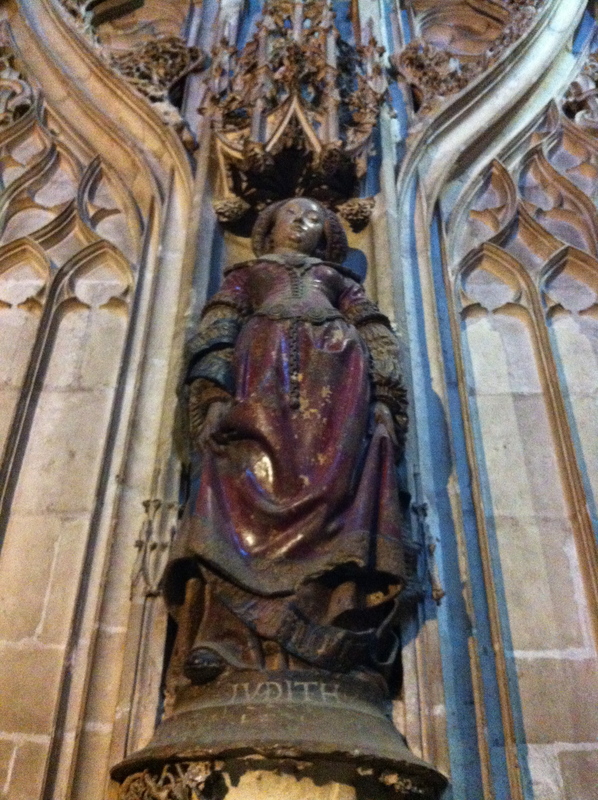 I’ll venture with some trepidation it had something to do with leaving the altar at the end of the church/cathedral pointing toward Christ’s birth and crucifixion, in Bethlehem/Jerusalem, but as I have mentioned, I am no expert on theology, nor liturgical architecture. 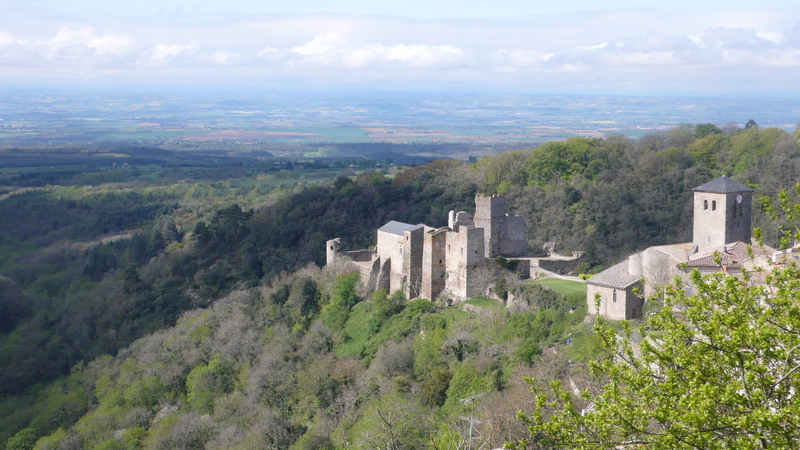 I hope to post soon about the amazing Cathar castles and fortresses of Languedoc, at Montsegur; Lastours and Saissac. Then later, if you’re interested, maybe I’ll even tell you about the last leg of my holiday, a long sundrenched weekend, spent at a stately pile in rural Norfolk in England. But those are other stories, for another day. Farewell for now. Arran: What a wonderful trip you must have had! These pictures suggest wonderful history and art. Thanks for showing us a small part of your journey. my pleasure Susan, and thank you for your kind and generous words as always. Fabulous post! Love the pictures. I was in France last summer and your pictures reminded me of the loveliness of the area. Thanks! Great article, Arran! 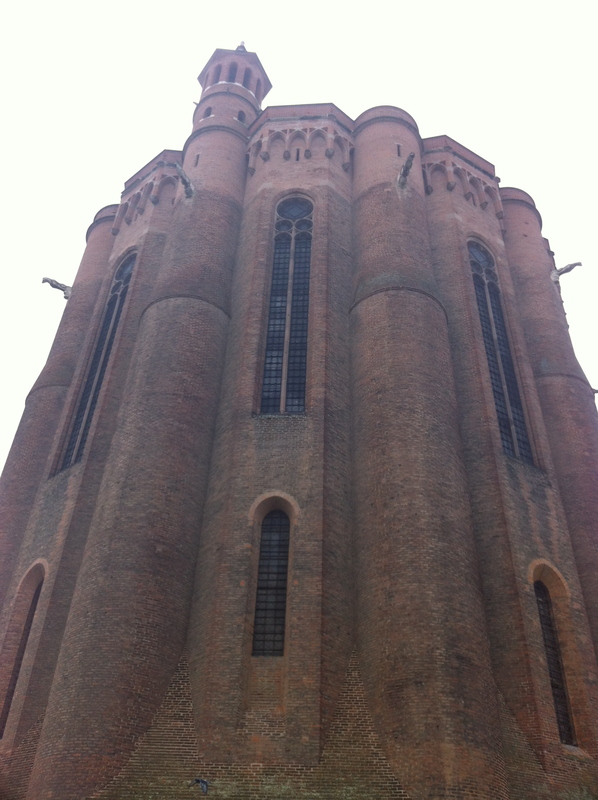 My husband lived in Albi and Toulouse for three years when he was a student in the ’80s and I have very fond memories. The cathedral is truely amazing, as you say, like something Tolkein might have dreamed up, and your photos capture that absolutely monolithic look of it. Reblogged. A blog-full of lovely pictures of a picturesque part of France. Many thanks Jane, appreciate that (Re-Blog), and also delighted you enjoyed and that it brought back some lovely memories. It is indeed a fantastic region. I’m only back in Dublin a couple of days & already I am dying (& scheming) to go back! And I’m scheming to get back to Dublin! Wow. Stunning, those photos are just stunning. 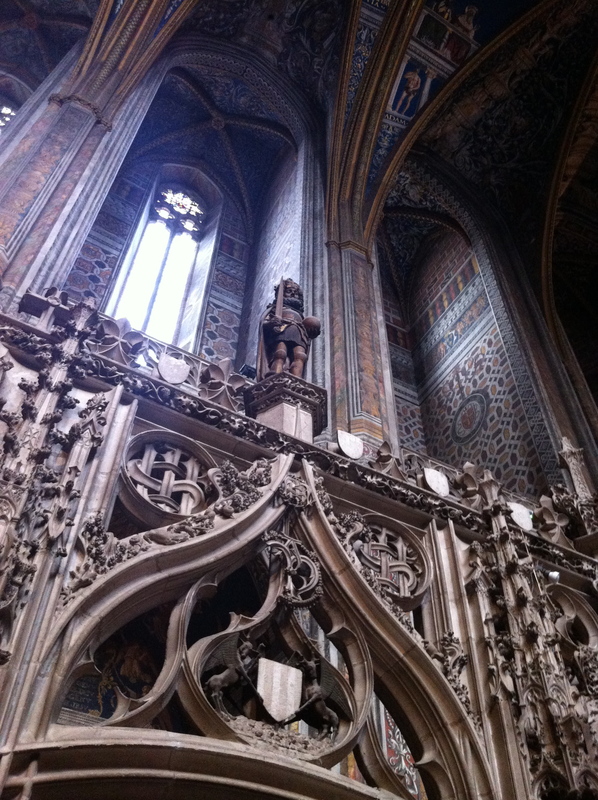 The Cathedral of Albi is incredible. I’ve never seen anything like it. Fantastic photos, Arran. I trust you sampled some good local wines during your stay in Languedoc, yes? To respond to your other point, yes, there’s some very good local wines, Can’t make any specific recommendations, alas is is all a bit of a blur. (I wish we’d has more time there, to build up a modicum of expertise) And of course you get exceptional value too on wines, from all across France. So, naturally, we completely lost the run of ourselves! I find these things happen in stages. First you think.”Wow, decent wine for €6-10″, (true, remarkably) “Lets drink lots!” And you are happy for 2-3 nights. Then, you have a flash of inspiration, ie: stop thinking like a student for a moment, – as it finally it dawned on us that if we spent 3 or 4 times that, then we might get something really, truly exceptional. And so it proved! One night we bought and had a really extraordinary Gigondas, which I suspect may have been 3 figures in London or NYC, certainly in a Restaurant. It was velvety utterly delicious! 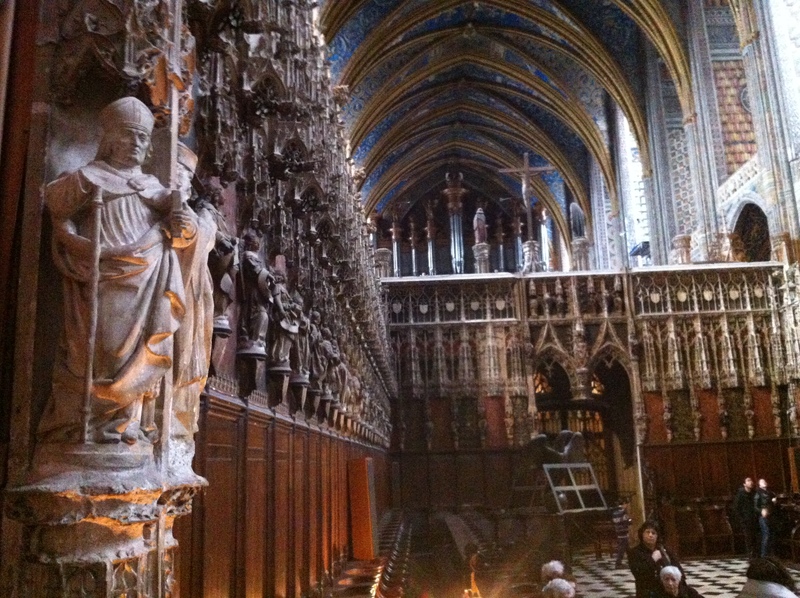 Delighted you enjoyed the Cathedral at Albi. 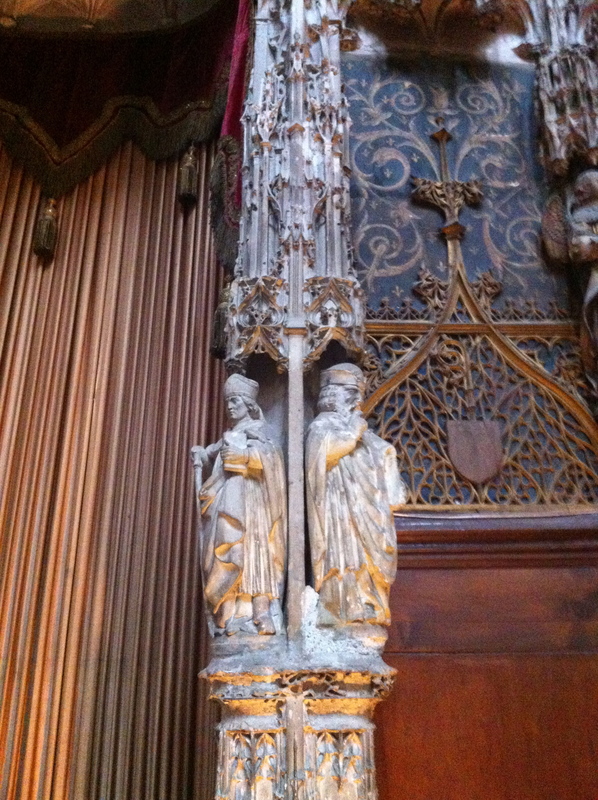 And no, I don’t think I have seen anything like it either, neither the sheer scale nor the quality of the carving. I’ve just added a small extra note to the post above, between some of the photos in the last part of the post (around the 2 angel pictures) hoping to draw peoples attention to just how out-of-this-earth-ly beautiful it is, and how very out of the “ordinary”, even by the already-EXtraordinary standard of medievel cathedral art. But I know you’ll already have noticed that very quality. -ArranQH. What an illustrative, comprehensive, entertaining and wonderfully crafted post! 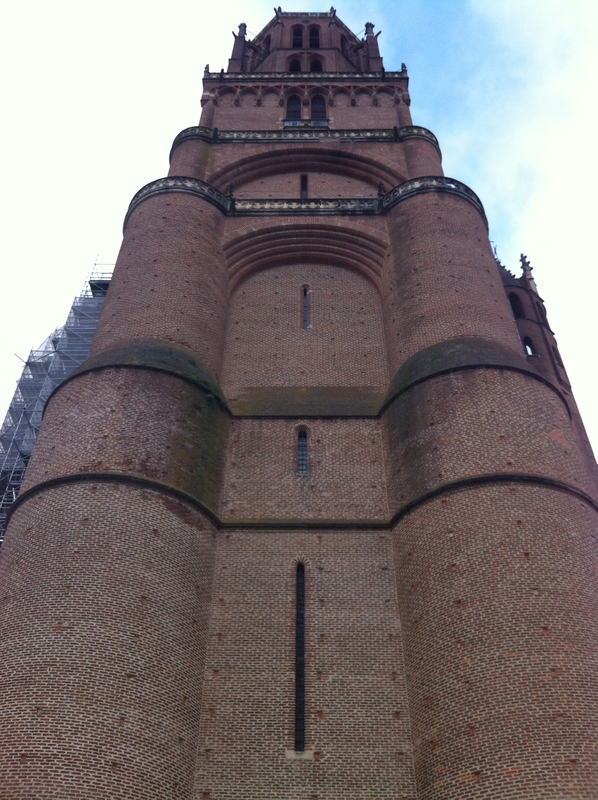 Albi must be grateful … We readers too. Nice to see familiar names here, Arran. I have been ill lately and not active on the blog, so it was a great surprise to see that you were in the Languedoc. The Cathedral Sainte Cécile is truly wonderful, isn’t it. Thanks for your visits Dennis, and I’m very sorry to hear you’ve been unwell. I sincerely hope you’re on the mend and up and about again before too long. 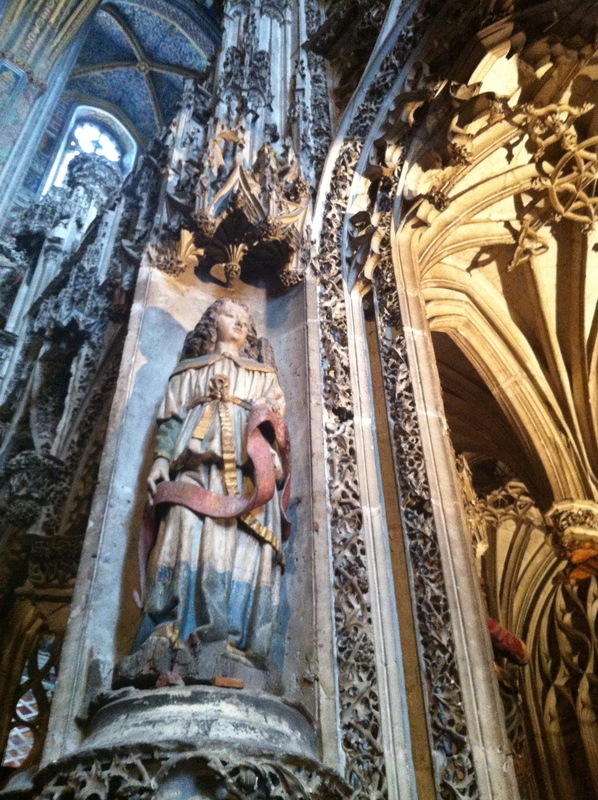 Yes, the Cathedral of Sainte Cécile is absolutely wonderful, the stone carving is I think perhaps the best I’ve seen. 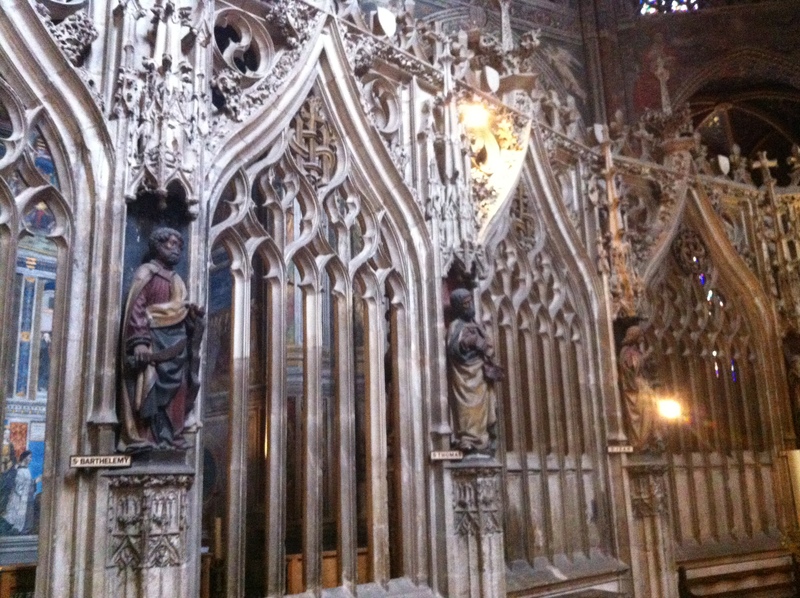 And the scale, of the whole thing -cathedral, rood screen & the whole decorative scheme- is eye-watering. Already itching to get back to Languedoc, love the lanscape and the history. Keep looking at houses there I can’t afford! Previous Post Plaques, gargoyles and granite shop fronts. Next Post Cathars | Cathartic.